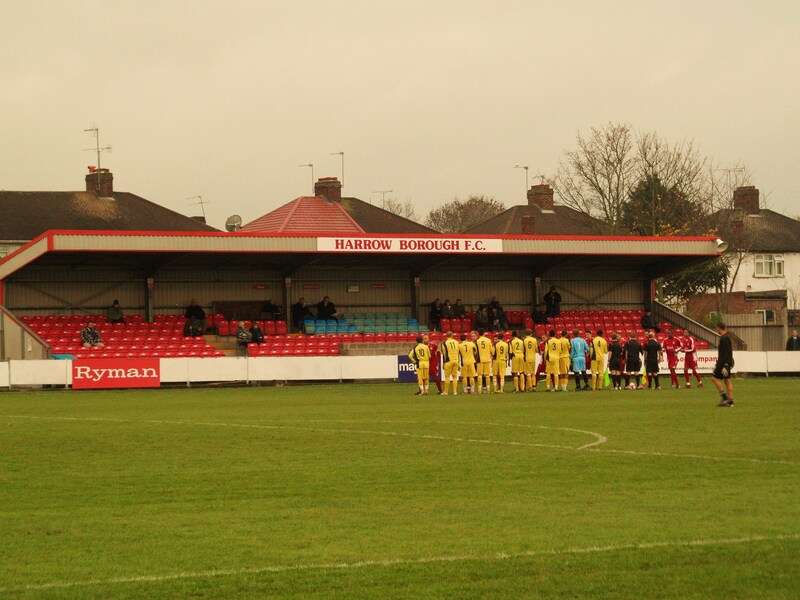 p>About EarlsmeadHome to Harrow Borough F.C. since 1934 a year after forming after they moved from a ground on nearby Northolt Road. A local pavilion was dismantled and rebuilt on the Earlmead site in 1938. Having been presented to the Club by a local land owner Mr G Champniss, later club president, it was to call the Champniss Stand. This stand had room for 250 seated and a further 100 standing. During the Second World War the Pavilion was successfully blacked out and the club could continue playing. In 1947-48 extra covering was built out of Ex-Anderson shelter sheeting and ex-government 6″ steel tubes. The remains of this covered terracing is still used on the South-east corner of the ground. Earlsmead initially consisted of two pitches but the second was sold to the local council in the seventies who then built Earlsmead Primary School on it. With the money raised from its sale Harrow Borough F.C. built a new clubhouse, floodlights good enough for TV cameras and concrete terracing. Whilst this major redevelopment took place the team would spend the 1973-74 season on opponents’ or neutral grounds. 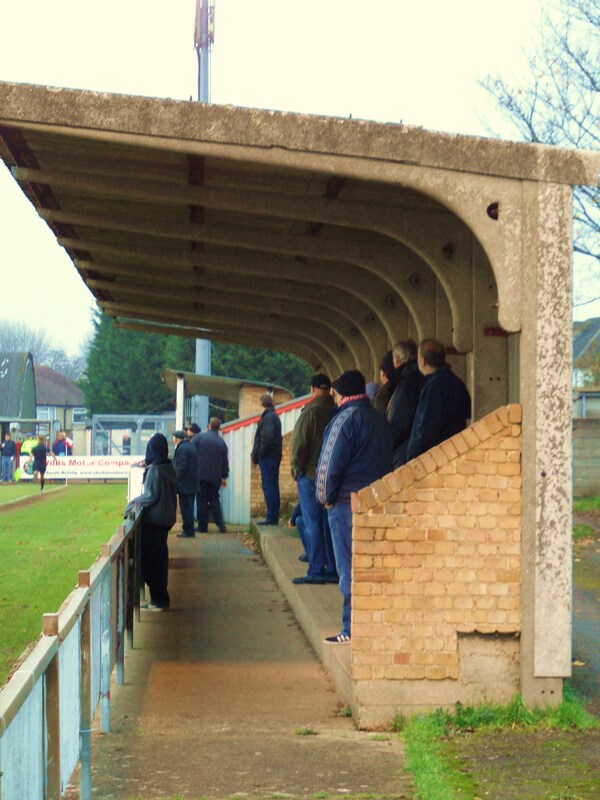 In 1995 The Champniss Stand was knocked after 57 years to be replaced with a modern stand to comply with new regulations. This new stand with a seated capacity of 350 was funded through private donations, club fundraising and the Football Foundation. Today the ground is a bit bleak in the winter with one end completely open to the elements, with the overflow car park behind it, and the two small concrete stands facing each other across the pitch. There are some nice little touches though. A noticeboard with handwritten notes about the season is a throw back to yesteryear and the slope of the pitch reminds you of giant killings of days gone by.How to get to EarlsmeadEarlsmead is near to South Harrow (Piccadilly Line), Rayners Lane (Piccadilly and Metropolitan lines), Northolt (Central Line) and Northolt Park (Mainline from Marylebone). The closest station is Northolt Park, which is just five minutes walk from Earlsmead., after a journey time of 15-20 minutes from Marylebone. After leaving the station, turn right under the railway bridge, and take the left hand fork into Alexandra Avenue and next right into Somervell Road. Bear right into Carlyon Avenue, and Earlsmead is the second on the left. From South Harrow Station, it is approximately 20 minutes walk to the stadium, or bus routes 140 and 114 take you to within a few minutes walk of the ground (114 being the nearest). The 140 should be taken in the direction of Heathrow and Hayes, leaving the bus at Alexandra Avenue. The 114 should be taken in the direction of Ruislip, leaving the bus just after passing Rooks Heath school on the right hand side. It is then a 5-minute walk to the stadium. Regular buses from Rayners Lane Station (H10 direction South Harrow Station), run as far as the junction of Eastcote Lane and Carlyon Avenue. From Northolt Station, route 282 runs to the end of Somervell Road. Route 140 (direction Harrow) takes you as far as the junction of Alexandra Avenue and Northolt Road. If you are driving from the south or west exit the M25 at junction 16, take the M40 East towards Uxbridge and London. Continue onto A40, passing Northolt Aerodrome on the left hand side. At the Target Roundabout junction (A312) turn left towards Northolt. Just after passing Northolt Underground Station on the left hand side, turn left at the next set of traffic lights, onto Eastcote Lane, becoming Field End Road. At next roundabout, turn right onto Eastcote Lane. At a small parade of shops, take the turning on the right into Carlyon Avenue. Earlsmead is the second turning on the right. From the M25 (junction 23) take the A1 south towards London. At the first roundabout you reach (petrol station on left), turn right onto Barnet Lane (A411), towards Elstree. A short distance along this road, turn left at the roundabout (still Barnet Lane towards Elstree). The road winds for about two miles, you’ll come to a crossroads with traffic lights at Elstree. Go straight over onto Watford Road. This road also winds for about a mile, and you’ll pass a pub and a small industrial park on the left. At the next roundabout (A41), go straight over (second exit) towards Harrow. You will pass immediately under a bridge, then about a quarter of a mile up this road, at the mini-roundabout, turn left into Heathbourne Road (A409). About half a mile along this road, you will pass a BUPA (Bushey) Hospital on your right. Soon after, at the mini-roundabout, take the right hand fork into Magpie Hall Road. At the next set of traffic lights (Alpine Restaurant on opposite right corner), go straight ahead. After less than a mile, you’ll come to another set of traffic lights (Cream coloured pub, Blubeckers on opposite right corner). Go straight over into Brookshill (still A409). After about a mile, passing Weald College on your left, you reach a roundabout. Turn right onto A410 Uxbridge Road. This shortly becomes dual carriageway. At the next roundabout – turn left into Courtenay Avenue. Go straight over roundabout, and continue down a short dual carriageway (passing Kodak on your left – road becomes Harrow View), to the next set of traffic lights. Turn right, into Headstone Gardens. Continue to next set of traffic lights at North Harrow. Go straight ahead (A4090 Station Road, becoming Imperial Drive), signposted to Rayners Lane / South Harrow, passing North Harrow underground station on your right hand side. Continue straight over at two sets of lights, then into Rayners Lane (passing Rayners Lane underground station on your right hand side) , continuing on A4090, Alexandra Avenue) After approximately a mile and a half, at the next major set of traffic lights, turn right into Eastcote Lane (a large pub called The Matrix is on the right hand side at this junction). Take the next left into Carlyon Avenue, then Earlsmead is second on the right…..PHEW you need a beer after all that!Admission to EarlsmeadAfter those complicated directions you will be pleased to know that it is relatively simple to get into Earlsmead. £10 for adults, £5 for the rest and programmes £2. 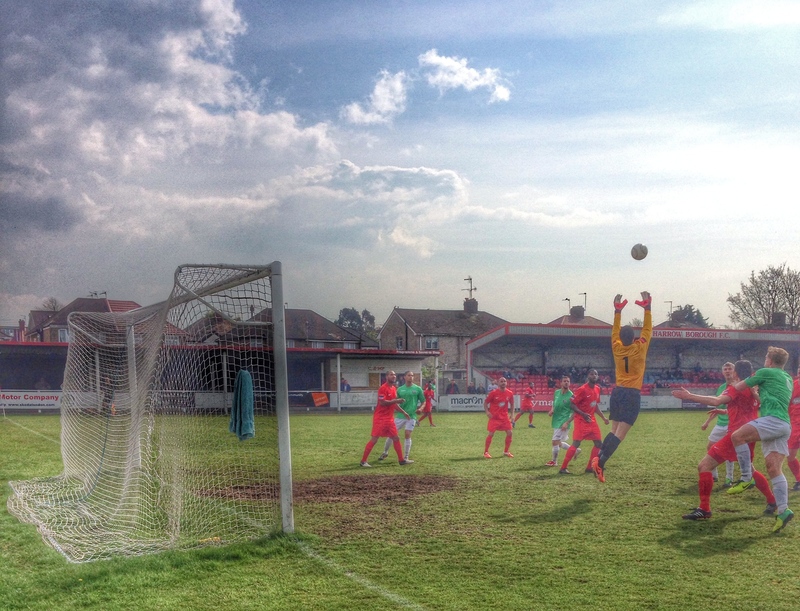 Transfer to the stand is free of charge.Our last visit – Harrow Borough 2 Lewes 0 – April 2014In a week’s time, step three of the Non-League pyramid will be concluded with the final promotion places decided by the play-offs. Unfortunately, the process of determining who will be playing where starts at this point as the respective leagues will enter into horse trading to ensure a fair and equitable split of teams. This undoubtably will lead to winners and losers. Unfortunately, the nature of the Non-League pyramid means that the words fair and equitable simply will not exist next season. In the past few seasons “Southern” teams such as Gloucester City , Worcester City, Bishops Stortford and Histon have had to ensure travel misery as they were placed in the same league as Workington, Barrow and Harrogate Town meaning teams have to travel thousands of miles each season. In the Ryman Premier League we have three three hundred mile plus away trips to Suffolk, hardly fun on a Saturday, let alone on a Tuesday night. Rumours started surfacing a few weeks ago that the most westerly clubs in the Ryman Premier League may be asked (and by asked I mean in footballing terms which equates to an order with a complicated appeal process involving unicorns and dragons) to move across to the Southern Premier League. With Wealdstone powering their way to the Conference South, it has left Harrow Borough and their current tenants Hendon in a potentially sticky situation of not knowing whether they will be heading to the seaside of Margate or Poole next season, or wearing their Christmas jumpers against Hampton & Richmond Borough or Chesham United. The 300 mile long return trips east to Lowestoft Town and Leiston would be replaced by near 600 mile jaunts to Truro City or 450 to Bideford FC. Fun for all the family I’m sure. Travel costs are a big part of any clubs budgets at this level, with coaches a pre-requisite for most away games with a match day squad of up to twenty five people when you factor in the management team. Gone are the days of players hoping on public transport with their boots to games. Today it is all about Travel Suits, Beats by Dr Dre and Snapchat. Guernsey’ position potentially in our league next season, assuming they win through the Ryman South play offs, has raised a few interesting eyebrows as they currently fund trips to the island for away teams and their management team, although that has led to a few issues this season including away teams delayed by fog, air traffic control restrictions and on one occasion, an air rage incident. Our final away trip of the season was Harrow Borough. Despite there being a pub on virtually every street corner in London, the modern world hasn’t quite made it to Northolt Park and there wasn’t one single pub (well, apart from the Earlsmead Arms which Beer in the Evening give a generous 2/10 and the last comments suggest it was now closed) within a fifteen minute walk of the ground, so we would slip under the radar of the Police and meet at Baker Street instead before hoping on the train. Few of us actually felt like coming at all. Our season had ended weeks ago and like our hosts, we would be playing for pride alone. In fact we had no idea whether we would actually have 11 players due to the number of injuries in the squad. But come kick off time, a squad had been found and the sun was shining. 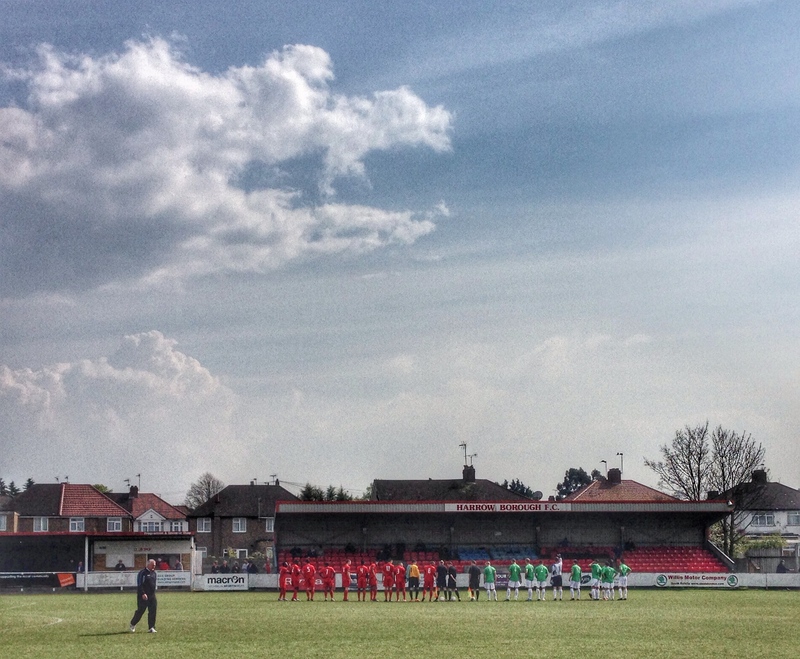 Ninety minutes to finish our season on the road with a win.Harrow Borough 2 Lewes 0 – Earlsmead – Monday 21st April 2014 It is the tradition in the UK that we should go to DIY stores on a Bank Holiday. That may have been the better option today. Lewes were better than in recent weeks but simply came across a keeper in inspired form. Four or five times James Shea made top-drawer saves to deny the Rooks, whilst at the other end Borough took their two chances to grab all three points. It was a damp squib to end our travels but we can’t really complain when we weigh up the alternatives of what we would have been doing on a Bank Holiday. Only time will tell if Harrow remain in our division. Talking to a few of their fans, they are happy where they are, every season hoping this will be the one. Let’s hope we will be assembling again at some point next season at Baker Street for the visit to Harrow Borough.Our last visit – April 2013This week has been painful for us Lewes fans. Our league position and survival hopes were in the hands of others as all of our relegation rivals played, some twice, between Tuesday and Thursday. There, of course, was an ideal sequence of events, but that was never going to happen. The form book was also a guide to how the results went, but once again, that went out of window. Twitter is a great invention for us football fans as we can get up to the second score updates, but only if people are there and able to relay events first hand. Tuesday night’s game between Cray Wanderers and East Thurrock United was watched by around 150 brave souls, yet it appeared no one thought of sending updates on the score, least of all the two clubs involved. The Nonleaguelive website is fantastic but can sometimes lead you astray as it automatically assumes a game is 0-0 unless it gets updates. So whilst we were happy to see the game still at stalemate at half time, there had in fact been two goals. For those who remember the good ol’ days of watching a vital game unfold on Ceefax, this was just as painful. On Tuesday night Hastings United finished their game at Hendon with 8 men, after 3 were sent off. On Thursday Thurrock ended with 9 against Lowestoft Town, yet for some bizarre reason neither team will be penalised in the final games of the season with suspensions as the cut off point for this season has already passed. The odds on those five still being at their respective clubs next season is slim so what message is that sending out? Perhaps the clubs will be asked to explain their actions to the Ryman League, but what will that achieve? In the Premier League, or Football League, suspensions kick in almost immediately. Why can’t non leagues adopt the same model? Doesn’t this send out a message that foul play is acceptable at the end of the season? Another ridiculous non league rule that needs to be revised, although I am sure they are simply too busy planning their end of season gala dinner (which, by the way EVERY club has to buy at least four tickets for…that’s fair, right?). Not that Lewes can moan about the situation we find ourselves in. Teams at the bottom of the league are not there because of bad luck. At the end of the season we could easily lay claim to awful decisions in the games versus Hastings United and Kingstonian that should’ve given us five more points (ironically both officiated by the same referee) but so can a dozen other clubs. Teams are never “too good” to go down. The simple act is this season Lewes haven’t yet made the top half of the table, the highest league position being 12th. Too many draws in the first half of the season, too many defeats in the second half have meant we are fighting a relegation battle rather than a play-off one as we expected at the start of the season. Clubs with smaller budges than us are challenging for the play-offs such as Metropolitan Police, Hendon, East Thurrock United and Concord Rangers. These clubs survive on crowds a faction of what we see at The Dripping Pan every other week. Three games left then. Eight days to save a season. All three are winnable, but we’ve been here before this season. A trip to Dave Anderson’s Harrow Borough could’ve just as easily been a trip to Stamford Bridge, but with a but more atmosphere. Boro’ are far from safe themselves. The results this week had simply pulled them back into the mix, sitting just five points above Lewes in the relegation zone. A win and they would be safe. Defeat and derby games versus Cheshunt next season could be on the cards. Earlsmead is the palatial home of Harrow Borough since 1934. It is one of the only grounds in England that still has the bomb shelters erected during World War Two. The roof of the ex-Anderson shelter, named after their current manager, Dave, is still visible in the corner of the ground. With survival at stake, the Lewes Lunatic Fringe met up under the watchful eye of the police at Marylebone. Some cynics would suggest they were there to marshall the Stoke fans arriving for the game at QPR, but we knew better. Big Deaksy, Cynical Dave, Terry Boyle…heck even Patrick Marber had dusted down the Fila for this one. If we were to go down, we’d go down fighting, just like they say on Green Street or Football Factory, but with a few more Greene King London Glory Ales inside us. The Lewes Express was running fast to Premier League survival, with one stop on the way at Wembley Stadium (railway station).Harrow Borough 0 Lewes 2 – Earlsmead – Saturday 20th April 2013This was one of these day which restores your love in the beautiful game. The sun was shining, the beer was flowing, the company was top notch and we won three points. Whilst the mood on the way up on the Survival Express was one of uneasy hopefulness, full of “what if’s”, on the way back it was exhausted relief. It hadn’t been a great game but for the first time in a few weeks we looked tight at the back, organised in midfield and offered a threat up front. Perhaps it was the very real threat of relegation, or the return from a four month injury lay-off of centre-back and club captain Steve Robinson. But at the end of the day three points are three points. Add in some favourable results around us and the win tipped the Rooks from relegation probables to possibles……and with a game against fellow relegation battlers Cray Wanderers to come in just three days time, survival was back in our hands. The away support was once again fantastic, supplemented by the non playing members of the Lewes squad. The word “team” has never been stronger than for this must win game. The sunshine was certainly very welcome, but we would have easily swapped the clement weather for three points any day. In truth it wasn’t the best of games. In fact the official twitter account of the home side tweeted in the first half “this is the worst half of football we have seen this season”. With the game ticking down to half time, and with neither keeper being tested, we were looking forward to some half time hospitality in the boardroom. But then a hopeful punt in the air saw the Harrow centre-back and keeper hesitate and Nathan Crabb sneak in between and place a perfect lob over their heads and into the corner of the net. The ball “nestled” in the corner of the net. Possibly the best word in football. Nestled. We all took a second to look at the ball in the net, nestling, before we broke into celebration. Not only did we look solid, we were now winning. And the sun was still shining. The second half saw us spending far too long looking at the scores from elsewhere on our phones, nervously remembering other one goal leads we had thrown away in the past. But then came the defining moment in the game. Godfrey chased the ball to the touchline, fell over with a defender who then proceeded to lay on the ball. Despite our protests and the fact the incident happened no more than five yards away, the linesman gave nothing. Fortunately, the referee some thirty yards away saw the offence and awarded a free kick. Harry Harding delivered the free-kick to the far post, Nathan Crabb got his head to it and it appeared to be bundled home by a combination of Ben Godfrey and a defender. Two nil, time for a little smile. The last period of the game saw a few nervous moments at the far end, but Lewes looked more solid than we have seen in previous weeks and the final whistle led to a huge sigh of relief. Cheap Polish lagers and a packet of onion rings were our celebratory treat for the way home and as we passed Wembley we raised a can. We may not ever get this close to the national stadium, but it looked like we would still be a Premier League side for another season. Away days don’t get much better than this.Our last visit – November 2010For what I am about to write may the Lord forgive me. Every so often I make bold statements. “I will not use my Blackberry after 7pm at night”, “I wont use my laptop in bed”, “I will have a weekend without watching any football”. What, can you repeat that last one again? I WILL NOT WATCH ANY FOOTBALL FOR A WEEKEND. Yes, in a mad moment some months ago I agreed that I would not go to any games for one weekend in a year. I once agreed never to lie to my Mum, agreed that I would never kiss another girl whilst I was with my first love (aged 8), agreed that I would only have “one more” on a night out (frequently) and that I would not ever, ever open that box under CMF’s side of the bed. So why on earth did I agree to this. With West Ham away to Liverpool and Lewes starting their almost certain run to the FA Trophy final I agreed to go with CMF to an old work reunion (hers not mine) in Hampstead. Fat chance of even getting to a pub to see a match, let alone an actual game – that area of North London is hardly teaming with football clubs. After driving up to North London, smiling at people I had never met, laughing with people I had met before and generally being the perfect husband/Father I was pulled to one side at 2pm. “You have been so good, do you want to go off somewhere to watch the rugby with Tom on TV?”. Sod the rugby I thought….Could I get to a game anywhere? A quick check on the TBIR iPhone app revealed the nearest club we had never been to was some 8 miles west-south-west in Harrow. And they were at home. Could I? Should I? Would I? Silly question really.“Erm….what about if we went and did a bit of Christmas shopping? There are a few things I want to get for you and the girls actually. Brent Cross is only 20 minutes away and I can be back to pick you up about 5ish.”Now I am not admitting to this being a pre-planned strategy but somehow a number of carrier bags from shops such as Marks & Spencers, Currys and Hotel Chocolat padded out with old clothes somehow managed to find their way into the boot of my car on Saturday morning. I have no idea why I would have done that. SatNav said it was 13 miles and 34 minutes. When the trusty TBIR taxi is fed information on a new ground it somehow miraculously finds its own way there, using short cuts and back doubles so it was no surprise that at 2.34pm we pulled up at Earlsmead, home of Harrow Borough FC. 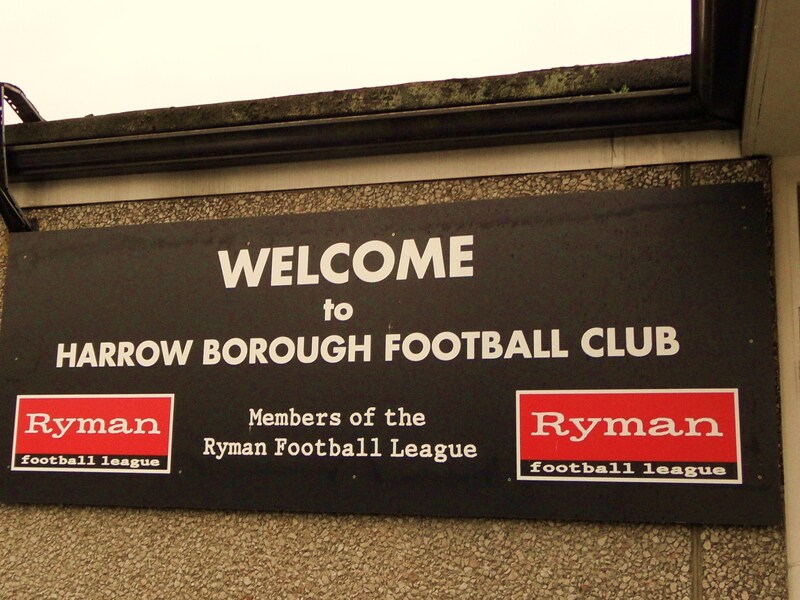 Harrow Borough had been in the headlines this season. Amazingly considering their league position in the Rymans Premier, their small supporter base and a seemingly difficult run of games, they reached the FA Cup 1st round for only the second time in their history. And to make the story even better they had been given a home draw against high flying nPower League Two side Chesterfield. On the day some 1,000 fans (BBC website suggests this figure was 2,500 but then again they make most things up) squeezed into Earlsmead for the game where they saw a spirited Harrow performance although the visitors eventually ran out 2-0 winners. It has been a bit of a mixed bag in the last decades for the club. Twice the club turned down promotion to the Conference, fearful of the financial commitment that would have entailed promotion. Then they came within one penalty kick of making the new Conference South in 2004 when they lost in a play off. Since then they have held their own in the Rymans under the guidance of David Howell who has now been in charge for 7 seasons, an incredible achievement for any manager in football, let alone one in the Non Leagues. Last season the club also got worldwide exposure not perhaps for the right reasons. Well travelled forward Rocky Baptiste joined the club from AFC Wimbledon, and whilst he has scored ten goals for the club he will be for ever be known for THAT miss. Surely you have seen that? No, well watch away and join the 1.12million who have seen it across the world to date. If Rocky thinks he has problems, then spare a thought for visitors Croydon Athletic. Promotion at a canter last season from the Rymans South seemed to signal the start of an upward journey for the club. Under the guidance of Tim O’Shea and Neil Smith the club started well, winning two and drawing one from their opening three games. And then events in a different world changed everything. A number of Pakistan players were involved in match fixing, the “fixer” was none other than the man who bought the club back in 2008, Mazhar Majeed. The club were then investigated for money laundering due to his stewardship. With finances withdrawn the club lost its management duo and most of its players too. The club were forced to cancel a number of games and withdraw from the FA Cup and things looked very black for their existence. 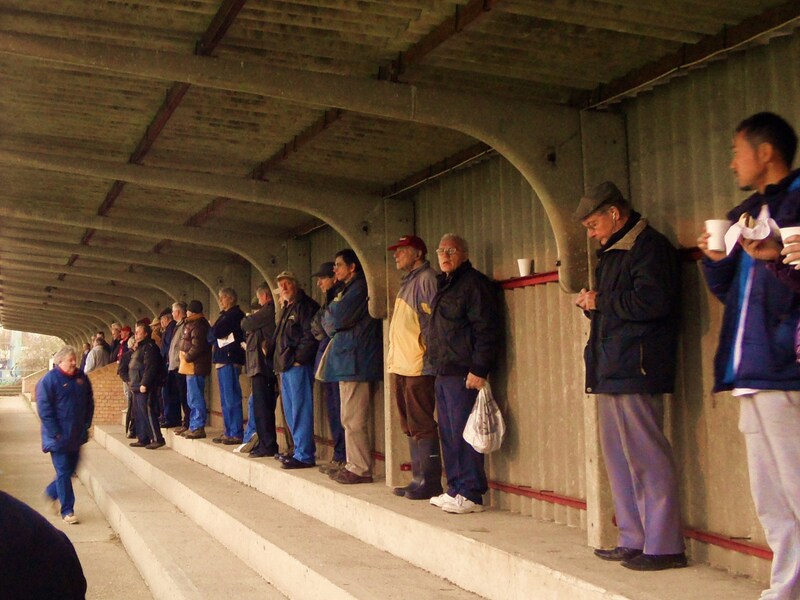 However, Non League football is all about unsung heroes so its testament to these people who the club were still here today. Whilst results have been unfavourable they came into this game off the back of an impressive 5-3 win against Margate.Harrow Borough 3 Croydon Athletic 1- Earlsmead – Saturday 20th November 2010Despite the cup exploits from just two weeks previously where the home fans had come out in abundance when I paid my £10 to enter I had to double check that it wasn’t a later kick off than 3pm. I counted around 95 people in the ground (official crowd was later announced as 112). Sure it was chilly but surely the locals could get a bit more behind their club? I had a wander around the ground, stopping to read the noticeboard on the wall. Whilst we are in the digital age where the information superhighway puts the world at our finger tips, there was something nostalgic about the handwritten notes on the board and updates on the club’s progress. After a minute’s silence impeccably observed by all present for one of the club’s Vice-Presidents the game started. My first observation was the slope of the pitch. Probably the most notable I had ever seen. The second was the car park at the other end of the ground. It was like watching a game back at Stamford Bridge in the 1970’s with the cars parked behind the goal. This was the overflow car park, but with only a dozen or so drivers it was surprising empty. However, on a number of occasions in the first half the ball struck the two vehicles with unerring accuracy and frequency. The first twenty minutes was all Harrow. They had genuine pace up front and were trying to get Baptiste and Hewitt behind the big Croydon centre backs but surprisingly the opening goal came from a completely different route. A miss timed clearance from the Croydon defence saw the ball fall to Troy Hewitt some 25 yards out and he smashed the ball into the net. Hewitt is having a great season for the club after winning the FA’s player of the round for his hatrick against Eastbourne Borough in the 4th Qualifying round back in October. I expected the home side to build on this but in keeping with their erratic league form this season they retreated, looked nervous and tried to hoof the ball long to the two forwards to chase. I continued by wander around the ground, eavesdropping on a number of conversations. “Are Weaselstone losing yet?” (My powers of deduction suggest they were referring to Wealdstone FC from just down the road). “I hate noisy away fans” (Croydon had brought four fans, two of whom had bongo drums). “I recognise that referee. He was on my plane back from Majorca in the Summer.” “Was he on holiday too?”“Nah he was one of those stewardess blokes” (I kid you not!) The home fans comfort soon changed when Croydon’s Elgar waltzed through the Croydon’s defence and then slotted the ball home. The Croydon fans went wild whilst Andy Turner, Harrow’s stadium announcer who stood at the window of the 1st floor of the club’s offices overlooking the goal simply shook his head in disbelief. He had seen this all before obviously. The half seemed to go on forever. In fact when the fourth official announced that there was one additional minute the time was 3.53pm. Not sure what happened there but it was a welcome relief to head next door to the warmth of the bar for a beer. It was very tempting to stay in there, Bombardier on draft and Soccer Saturday on the TV but that was not what I had committed one of the seven deadly sins to do. I headed back out just to see Croydon come mightily close to taking the lead when the hit the woodwork. The away tifosi went mad at the far end, reliving the moment time and time again much to the keepers annoyance. It wasn’t the best of games and the veteran Harrow fans in the corner of the ground bemoaned the modern game and these “Fancy Dan boots” and players wearing gloves. In fact it seemed like Harrow’s right back, Kwasi Frempong was only wearing them so that he could get better grip on the ball for his long throws. I was on a short timer, knowing that I had to get back to Brent Cross tube station to complete my “diversion”. I had promised to be there at 5pm so I was always going to have to leave before the final whistle, which is normally a capital punishment offence, but I did not see why I should be adding slothfulness to the ever increasing list of deadly sins I had committed on the day. And of course as soon as I set foot outside the gates there was a cheer. I peered over the fence to see Harrow’s players celebrating Walters goal. Again, I could lie and say I saw it , but I didn’t so there. I had hoped that Rocky Baptiste would get on the scoresheet so I could try and right a few wrongs but he hadn’t as I reached the car, ready to do battle with the North London traffic. But of course he eventually did in injury time to make the final score 3-1. I pulled up at the tube station. Did I come clean? Well I’d rather keep that one to myself, just in case there is a next time.